This week we are talking all about automating vocals and breaking your mix into parts. Announcer: This is the MixCoach podcast number 69. John: On this episode of the podcast we’re going to talk about automating vocals and a simple way to break something down from a huge track count into its individual parts and make it simpler to mix and get an overall better final product. John: Hey, Kev. Kevin: Hey, John. John: On this episode, we’re going to talk about automating vocals. This is something that when I first started coming over here working with you a decent amount, years ago, I don’t know how many years it’s been now. You changed the way I approached automating vocals. It was kind of a game changer for me as far as in my mixing abilities. Let’s talk a little bit about how you approach vocals and vocal mixing. Whenever you go to automate the vocals, you break it down into different subgroups. You’re doing the stacked vocals, if there are multiple vocals of the same part. You’ll mix those. Then you’ll mix the background vocals and then the very last thing you do it mix the lead vocals. If there’s a vocal and then if it’s a trio, you’ll mix the trio last, those three guys. Explain your workflow whenever you go into mixing vocals. Where in the process does that happen? Does it happen last? Does it happen somewhere in between? Kevin: Typically it happens last. I’d like to say that I never solo anything. I even believe that people that say they don’t solo stuff are not actually telling the complete and total truth. They probably do solo stuff [laughs]. John: Right on. 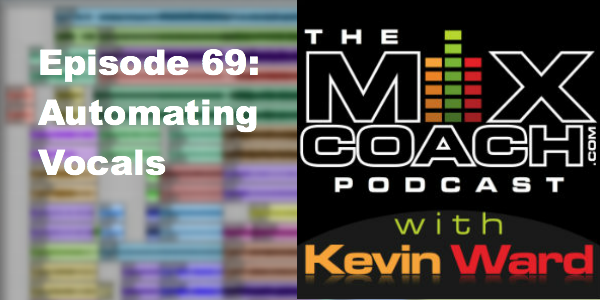 Kevin: What I do, what’s built in to my workflow I guess is…we covered it a long time ago. I think you called it the… John: Hierarchy of mixing. Kevin: …of mixing, yeah. John: It’s a mixing pyramid, essentially. Kevin: In my mind it was a pyramid. Whatever’s supposed to be the loudest is on top and you mix it last. It’s what I call “Last is loudest.” John: Yeah. Kevin: Basically, what I’ll do is I’ll mix instruments, drums, everything first. Then I’ll mix the fill instruments usually next, which is in between vocal phrases there’s usually an instrument that plays. John: Right. Kevin: They call that a fill. They’ll trade off, “You take the first verse fills, I’ll take the second verse fills and then still or piddle will cover the choruses,” or something like that. It’s filled. Third is usually the instruments that are playing the fills. I’ll make sure that I can hear those. Basically, what I’m doing is I’m mixing. A few weeks ago, we talked about what you deliver to a record company. John: Right. Kevin: Basically, I’m mixing those in reverse order. I’m mixing the instrumental track first, then I’m mixing the TV track, and then I’m mixing the vocal. Typically, what you mix last, you mix loudest. Typically, what I’ll do is after I’ve mixed the fills and the instrumental track is done, then usually I’ll take the background vocals, or choir. I’ve mixed songs with background vocals, choir, stacks, trio, and lead vocal altogether. You kind of have to, in your mind, put those in what the order is of importance, and what would be the most clear path to a good mix. I’ve gotten it down to where it’s drums and bass, instruments, fills, choir or background vocals, stacks, and then lead vocal. John: Nice. Kevin: In that order. Going from the bottom of the mixing pyramid, what I just mentioned was the bottom of the pyramid, drums and bass. As you go toward the top, it gets more narrow and more focused, what you need to concentrate on the most. In country and gospel, even jazz, if you think about, if it’s not sung there’s usually an instrument that is like the lead vocalist. Even when I’m mixing that, I’ll mix that last. Why go against what you just naturally do and that’s mix what you’re mixing now. You mix it loudest. If you mix it in the right order, in that workflow, it all becomes pretty simple. We can break down even more. Background vocals. Usually, they’re stacked. Usually it’s soprano, alto, tenor, or whatever. It’s three parts. John: Like a double of those. Kevin: Yeah. They’re all doubled. Usually, what I’ll do is I’ll mix each part, or at least two parts at a time, because I find that my ear can blend two parts together, but if it’s three parts, it’s a little harder because you haven’t… John: “Where’s the fill in that middle part?” You have to determine what’s the most important part all at the same time. Kevin: You’re trying to multitask, really. You’re trying to get blends between three parts, but really… John: You only have two ears. If you had a third ear, maybe. Maybe it would work. Kevin: Don’t you have a third ear? John: Oh gosh. Kevin: [laughs] No, but usually what I’ll do is I’ll even mix that on its own level of the pyramid. I’ll mix those two parts at a time. Usually, I’ll take the two harmony parts, and I’ll mix those together. Then I’ll put who’s singing the melody in last. Tuck it in under those two other parts. Then you’re pretty much done. Sometimes I’ll even ride that whole subgroup to make sure that that’s blending in with the track. Then I’ll put the stack in there, or the lead vocal, whatever’s next. I mix backwards all the time. Mix in reverse. John: The other thing that changed the way I thought about riding, almost anything but more so the vocal part of it, the vocal aspect, is you look at the meters as well and even up everybody to the same general level whereas before I talked to you and watched you mix and you introduced this idea, I would just listen and go, “Okay. Well, then they need to go up here at this point because that’s a cool lick,” that sort of thing. I was only boosting the cool licks as opposed to making them match with each other and blend well across the timeline. They were sticking out at moments whenever I felt that they were singing something cool, but they didn’t blend throughout the entire timeline of the track. Explain the metering process, where you look at the meters and try to get them even across the time. Kevin: Let’s say you’re mixing two vocal parts that are doubled vocal parts. You’ve got them split out, left and right. It’s really hard, if you listen in stereo, for you not to be distracted by the right side and the left side. You want to listen to if they’re even. I almost always, we talked about 80-20 and I’ll mention it again, 80 percent of the time I’m mixing in mono. If you’re mixing in mono, you can’t really tell if the right vocal is loud or if the left vocal is loud, nor would you really want to because you’re really looking for a blend. In mono, what I’ll do is I’ll look on my meter, which I used to have a Control 24, and I would look at those… John: Those meters. Kevin: There’s the hand to forehead thing again like, “Why did I ever get rid of that piece of gear?” But I digress. Usually what I’ll do is, instead of concentrating on what’s on the left and what’s right, look at the blend and I’ll know, by listening, that they’re both in the center of my head, that one is louder than the other. You look at the meter, and you can tell instantly. You have to set your meters up right. You have to set your meters up post fader to where what you do on the fader reflects on the meter. Usually, if you keep those in the same area, then they’re blended. They blended about as well as you can blend one. That’s one part. The second part, typically, sometimes you forget which part is the high part, which part’s the low part. Usually, if one starts to step out of balance, you look at the meters, and usually the one that’s hotter is the one that’s louder so you compensate on that. I definitely mix vocals as much with my eyes as I do my ears. John: That was kind of an epiphany for me as well because I never really approached them that way. It was always “boost what’s cool,” as opposed to blending them together to where they matched, to where they were a unit as opposed to just individual vocals where you would break them down and mix that unit in sections really helped as well. It made something so complex as, “Take these 14 background different vocals and mix them.” That seems very hard in your mind. I don’t have 14 fingers. If you break it down into the sections and break it down into its individual parts, keeping it within the same essential volume range whenever you’re riding each individual part, then whenever you blend them together, they work. Make sure they’re all working there. That just makes it so much simpler, to break it down into each individual part. Kevin: It can be very overwhelming if you get a mix with a high track count. If you don’t know how to build it into a workflow that you automatically go, “These go together, that goes together. I’m going to mix this, then I’m going to mix this.” If you have a workflow that lets you do that sort of thing, then there’s really nothing that can overwhelm you as long as you can organize it first. One side of your brain organizes it and the next side of your brain… John: Then you go get some coffee and then you come back and have the other side of your brain, the creative side to take over. Something that an orchestral arranger told me one time was that if you’re organizing in an orchestra, if each individual section sounds good within itself and fits with the chord structure and that sort of thing, it will end up sounding good together. They’ll fit together as long as they sound good individually. It’s kind of the same way with a mix. I think we talked about this on a previous podcast a while back about workflow. If each individual section sounds good, if the instruments and the vocals sound good together and if just the instruments and the drums sound good together, that sort of thing, then your mix is going to sound good. Kevin: Well, if you remember, when we first started working on this, we mixed an orchestral piece. It is now the MixCoach guide to mixing orchestral music. That’s actually you and I sitting down and me showing you how I went about approaching an orchestra. That was one of those things where if you look at an orchestra as a whole, then it is overwhelming. You do tend to go with just the room mics, if it’s recorded that way, which they rarely are in Nashville these days, it’s all recorded in different sections, as you know If you break it down to the woodwinds, balance the woodwinds like you would a quartet or two at a time. Sometimes during a song they’re playing all four at once, and then you approach it that way, but most of the time it’s only two or one at a time. If you break it down to the woodwind section, is it blended? Yes. Okay. Listen to the trombones. Are they blended? Yes. Are the French horns? Are they blended? Yes. Then, once you get everything blended together, at some point it becomes the orchestra and the band. Then it becomes the orchestra and band and then the vocals. It’s a pyramid. You work on the bottom, and you build the foundation as well as you can, then the pyramid stands on itself. You can take any one block out of the pyramid and the whole mix will still stand whereas, if you build it from the top down, pulling one thing out is going to completely… John: Just wipe you out. Yeah. Yeah, yeah. For sure. Alright guys, well, that covers everything as far as automating vocals as well as breaking things down into their individual parts and making mixing something with high track counts simpler. Announcer: Thanks for listening. This has been the MixCoach podcast. The podcast dedicated to making your next recording your best recording. For more tips, tutorials, and even a free course, be sure and visit us at MixCoach.com. Question: Do you have any tricks that you use when automating vocals?